Shannon Ownby of Fabrics and Quilts sits with her tables of quilting supplies and fabrics. Many beautiful old-style quilts were on display at the Cannon County Senior Citizens Center and other community locations on Saturday. 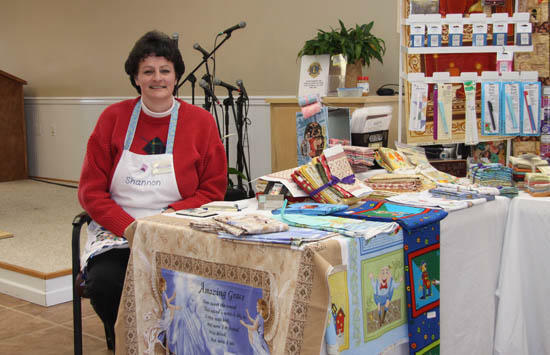 In addition to enjoying the beautiful quilts and appreciating the traditional craftsmanship, patrons of the tour could browse and purchase quilting supplies and fabrics from the vendors who were set up. My grandmother Hazel Parker had several of her quilts displayed. I took her and my son up on Friday and i was so proud of her. I heard so many people compliments on her quilts. I have admired her work for a very long time and am glad that everyone got to see her handy work. Also Ms. Lolitta Rawlins one of my grandmothers friends had several quilts on display they both won a couple of awards. Such beauty in tradition that sadly is slowly fading away.